Lumina Gateway Automation: New cloud. New apps. New web-based setup and control. New features. The Lumina Gateway is a cost-effective wireless energy management automation eco-system perfect for Retail, Restaurants, Small Offices, and other small commercial facilities. Turn lights off at a certain time each night, ramp up thermostats each morning, and remotely access generators, compressors, fountains, water heaters, and more. Recently, the user experience and feature set have been enhanced in several major areas: a fresh unified app/web interface for customers, a new simplified way to program systems, plus the infrastructure to scale to hundreds of locations. Register as an installer on the new Leviton Cloud Services, here. 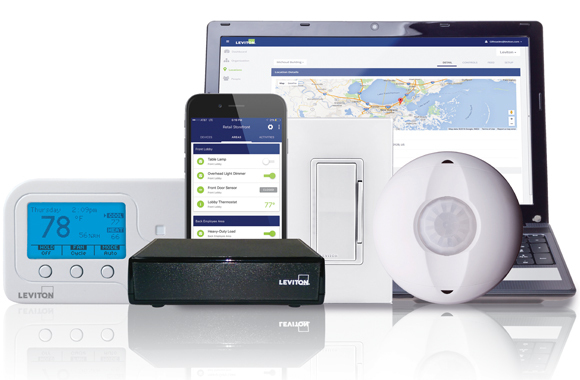 The Lumina Gateway and Lumina RF wireless devices are available now, along with the new Leviton Cloud Services website and app. Installers can easily automate lights to illuminate upon motion, thermostats to activate based on occupancy, signage to active based on schedules, and provide advanced features via subscription services.